60th Wedding Anniversary Gift. Couples Name Print. This 60th anniversary gift will be displayed forever because it is such a unique anniversary gift. This 60th anniversary print shows each person�s name, name meaning, and general personality traits associated with that name. 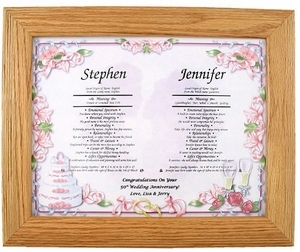 The couples print can be personalized with the couple�s names, birth dates and a 100 character personalized message from you, displayed in the lower center. This couples anniversary print is done on a couples artwork that shows a wedding cake and champagne in an 8 1/2" x 11" oak frame. This 60th anniversary gift will be one that is kept in the family. See also our other 56th anniversary gifts.